Brazilian Walnut is a proven decking material you can rely on. Industry and design professionals from across the world have called Brazilian Walnut, the "premier wood decking" on the market today and for good reason. Why? Brazilian Walnut is the only solid wood decking option that consistently outperforms other options. You won't find a natural wood deck material that offers this many benefits. From natural mold and decay resistance to superior strength, a deck made out of Brazilian Walnut will give you decades of solid performance. 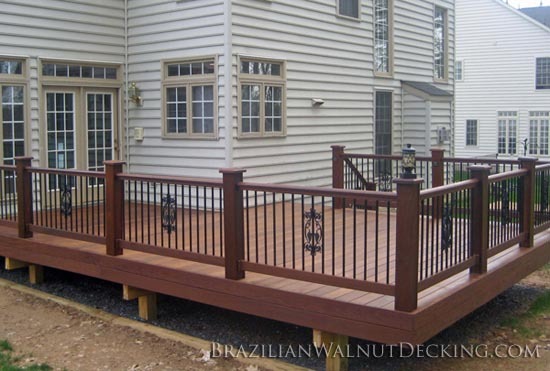 If you're looking to build a deck, then Brazilian Walnut is the stand-out best choice for wood material. Don't settle for short-lived domestic hardwood; properly taken care of, a Brazilian Walnut deck will out-live you! Brazilian Walnut An extremely dense, tight grained wood. Generally a deep rich brown with some pieces displaying red and amber hues. 3600lbs 22,560 psi Highest rating for insect (termite) and decay resistance. Deck oil treatments offers 75+ year lifespan. Douglas Fir A light reddish-brown wood with generally straight grain. 670 lbs. 12,400 psi Not naturally resistant to decay. Should be painted or stained to prevent decay. Pressure Treated Pine Very pronounced grain. Dusty yellow-green color due to chemical treatment of the wood. 690 lbs. 14,500 psi There are 2 commonly used chemical preservatives, MCA (Micronized Copper Azole) and ACQ (Alkaline Copper Quaternary). These chemicals are forced into the wood to help reduce decay but there are some potential health concerns with these treatments. California Redwood Several grades available that vary considerably in appearance and quality. Usually straight grained with a fine, even texture. Color varies from cherry-red to dark reddish-brown. 480 lbs. 10,000 psi Premium grades are more durable than most woods in common use. Resistant to decay, but relatively soft and quick to weather. Treatment is recommended. Western Cedar Fresh cut, this wood appears a salmon pink color which turns a coffee brown over time. Species is generally straight grained. 580 lbs. 7,500 psi This softwood is more durable than most woods in common use. Resistant to decay, but relatively soft and quick to weather. Treatment is recommended. Philippine Mahogany Interlocked grain similar to true mahogany, but with a courser texture. Species is generally medium to dark brown. 760 lbs. 12,000 psi Only the dark red species are resistant to decay. Although more durable than cedar and redwood, it is still relatively soft compared to Brazilian Walnut Decking. Before you buy, you might want to check out what people like you have created in our Brazilian Walnut Decking pictures gallery. In addition to standard deck boards, we also sell decking tiles, which can be an easy and fast way to install a unique-looking deck. If you're ready to get started, contact us to buy Brazilian Walnut Decking. © BrazilianWalnutDecking.com, All rights reserved.